Are you ready for the #BHMChallenge? Are you ready for the #BHMChallenge (Black History Month Challenge)? 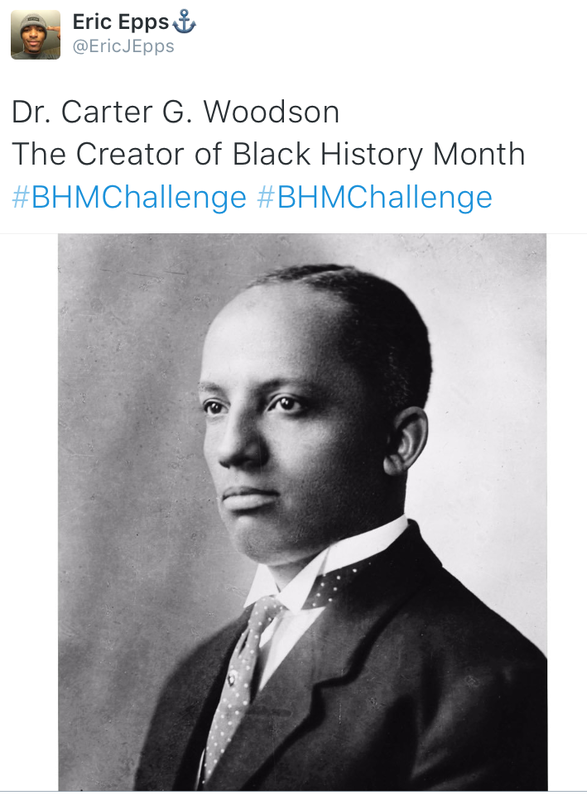 Eric J. Epps created the hashtag #BHMChallenge in hopes of challenging his followers on social media to learn something about the historical month. The idea sparked after he continuously saw people complain about the historical month. Epps hopes to feed his followers with interesting and inspiring facts about historical figures such as Dr. Woodson, W. E. B. Du Bois, and many more. Dr. Woodson, founder of the Association for the Study of African American Life and History. Though the challenge has yet to grow, he said he would love for everyone to, “…participate in this activity and just see how much [people] can learn about [themselves] and each other.” He also suggested that people get involved in their communities by supporting a black-owned business this month like a nearest soul food restaurant, or bookstore, or attend a black film festival. Epps added that communities should, “…take this time to meet more black people around [them], [their] campus and in [their] community.” “It’s my challenge to everyone to learn and teach and to celebrate this month with pride,” he said via email. With that said, grab your phones or laptop, do your research, and enlighten someone today. There is so much history that the media does not cover. Let’s let our voices be heard! #BHMChallenge.